While the Bahrain Grand Prix, the fourth race on the Formula 1 series tour in 2012, took place under a warm, sunny day, the mood around the event's weekend was anything but picture perfect overall. Due to ongoing political tensions in Bahrain, the Formula 1 race on the 5.412-kilometer was centered in a volatile circumstance that caused many to decade before, during and after the event whether holding the 2012 grand prix race was in everyone's best interests. Ultimately, drivers and team cars took the grid Sunday for the 57-lap Bahrain Grand Prix committed to run the 4th race of the year as planned. Taking an important pole Saturday, defending Formula 1 champion Sebastian Vettel was set to start the Bahrain Grand Prix at the front for the first time in 2012. From his standing start, Vettel launched his Red Bull-Renault to a quick advantage over Lewis Hamilton’s McLaren-Mercedes. While Sebastian Vettel and his Red Bull Racing car leapt to the lead of the Bahrain Grand Prix early, teammate Mark Webber incurred a less than impressive start losing ground. Webber would recover to an admirable fourth place finish and faired better than the 6th starting Scuderia Toro Rosso of Daniel Ricciardo. Receiving damage to his STR-Ferrari while fighting in traffic, Ricciardo pitted on lap 7 for tires and a new front nose assembly. Daniel Ricciardo crossed the line 16th after what could have been a promising points-scoring day at Bahrain. Only four drivers would retire from the 57-lap Bahrain Grand Prix dominated by the two Williams-Renault cars. The first Williams race car, Pastor Maldonado, completed 25 laps after suffering a tire puncture after spinning in turn 1. 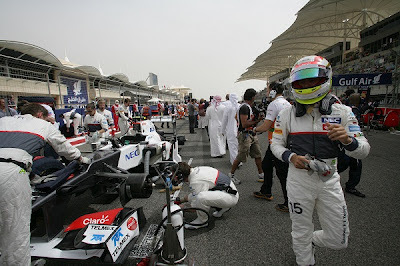 The #19 car of Bruno Senna pushed deeper into the Bahrain Grand Prix despite what was described as a major vibration. Retiring 3 laps short of the race’s full distance, Senna and the Williams F1 Team chose to safety park the vehicle when handling problems became too severe. With one Renault-engined team leading the event, another group running the French-badged power plants emerged in impressive form. The Lotus F1 Racing team had a landmark race on the Bahrain International Circuit as car pilots 2007 Formula 1 World Champion Kimi Raikkonen and Romain Grosjean surged into the top-5 after gaining from mid-front qualifying positions. In the second-half of the Bahrain Grand Prix, the Lotus-Renault of Kaikkonen was stalking Vettel’s Red Bull race car. The third Formula 1 season since the Lotus name returned to active competition, the race team is hunting to put the British marque into victory lane for the first time since the US Grand Prix in Detroit in 1987. The final pit stops of the race sealed a victory for the Red Bull Racing driver Sebastian Vettel. At lap 39 of the Bahrain Grand Prix, Vettel and second-place Raikkonen made final pit stops. While Vettel receives much of the credit for grand prix victories, this race saw the Red Bull Racing pit crew emerge as the key to the German’s success at Bahrain. Belting on the Pirelli slick tires at a lightning-fast pace, Vettel sailed out of the pit lane with a lead of more than 2 seconds over the Lotus-Renault of Raikkonen. 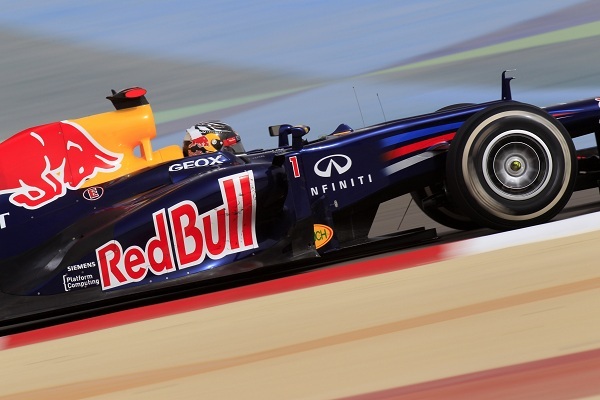 The interval was maintained by Sebastian Vettel through the last stint of the event for the Bahrain Grand Prix victory. Winning the Bahrain Grand Prix by 3.3 seconds over Raikkonen's Lotus-Renault, Vettel and Red Bull Racing stood at the top of the podium for the first time in 2012. A starkly different than last season where Sebastian Vettel won three of the first four events, the reigning champion driver and team is now the four different Formula 1 combination to win during the 2012 season. It was 2003 when the last time four separate drivers began the Formula 1 with victories. Along with Vettel being the fourth Formula 1 driver to win in four races, Red Bull Racing is also the fourth different vehicle make prevailing this season. The last time four grand prix teams won in the first four-race span of the Formula 1 season occurred in 1983 when Brabham, McLaren, Renault and Ferrari teamed up for that rare honour. "I’m slightly disappointed we didn’t take the win because we had the pace." said Lotus F1 Racing's Kimi Raikkonen who finished a team-best runner-up position. Raikkonen adding "I only had one chance to overtake Sebastian (Vettel) and unfortunately I chose the wrong side to try and get past. If I hadn’t made a small mistake at the start and allowed Felipe (Massa) to get through then maybe it would have been a different story, as we spent quite a lot of time fighting with him." 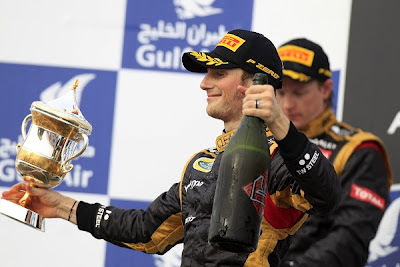 Raikkonen’s teammate Romain Grosjean was also able to speak highly of a career effort with Lotus F1 Racing saying, "We’ve known all season how quick the car can be, but with such a tight field any small mistakes can make a huge difference. Today I think we got everything right, and we’ve finally been able to prove how competitive we are." Outside of the podium-scoring position, Mark Webber made the Bahrain Grand Prix a major triumph for Renault engines covering the top-four spots at the end of the 57-lap event. Nico Rosberg driving for Mercedes GP was declared the top non-Renault powered vehicle in 5th place. Winning the first race of the series in dominate fashion, the McLaren F1 racing team has found it difficult to match their opening event success. With Hamilton starting 2nd and Jenson Button positioned in 4th at the start of the Bahrain Grand Prix, the McLaren-Mercedes vehicles would progress through the 57-lap event with increasing frustration. Foiled during the last stint of the Bahrain Grand Prix, Lewis Hamilton suffered a lackluster pit stop that allowed the 2008 Formula 1 World Champion to finish no better than 8th. For Button, he settled with a 18th place result after a late race tire puncture. Thanks in part to a two-pit stop strategy by Force India, Paul Di Resta scored an impressive 6th place finish enduring 24 laps on his final set of medium compound Pirelli tires. Though finishing in the lower part of the top-10, both Ferrari race cars left the Bahrain Grand Prix sporting point-scoring efforts. Malaysian Grand Prix winner Fernando Alonso crossed the start/finish line of the Bahrain International Circuit 7th while teammate Felipe Massa finished 9th. Massa’s first points of 2012, the much-needed effort for the Brazilian driver could be effort to spare his seat in the Scuderia Ferrari race car for at least the remainder of this Formula 1 season. Michael Schumacher was the last driver locking up points in the final results of the Bahrain Grand Prix. The Formula 1 teams get three weeks off ahead of their first European continent event. The 2012 Spanish Grand Prix is the next race on the Formula 1 circuit set for May 13th.